10:35 AM I have seen several references to Eight Mile Grove, but don't see it on any map of Henry Co. My Great Grandmother obituary says she was buried at Eight Mile Grove Cemetery in 1912. I don't see any references to that cemetery on the internet. Is it the same as Lorraine Twp cemetery? Does anyone know if there are Nortons, Blairs, Beers or Kemmis buried there? Any info is appreciated. What fond memories I have of "Specht's Corners". We traveled many times to Walnut, IL to visit family and as kids we thought that we should stop and eat there. EVERY TIME! My mom grew up in Eight Mile and we were told it was called that because of the eight mile grove of trees the early settlers found when they came down from Naperville about 1858. The Alsace-Lorraine bunch; Egert, Clementz, Yackley, Grose, Rink. They first were near Hooppole in Yorktown Twp near the two lakes that were there. All drained for farmland. There was a small store at Rickel with a post office, a gas station at the corner of 92 and Atkinson Blacktop, another Newlon Station up the road. Quite a gathering place at one time. Only two churches close, Loraine for the Protastants (sp?) and St. Mary's for the Catholics. I get teased a lot by my children as each time we drive 92 I have to explain who lived where, name of the schools, and churches. I love a good eye roll! 7:09 PM Hi Denise ... Thanks for your quick response. Based on the information I read on this website and others, Eight Mile Grove Cemetery is probably the same as the Kemmis Cemetery, aka Rickle Cemetery & Union Cemetery. I also learned there is another cemetery in Loraine Twp besides the previous one and the Loraine Twp Cemetery ... the Bowman Cemetery. Now which one are my ancestors buried in? 5:16 AM There is another cemetery in section 4 as well as the Kemmis/Union Cemetery in section 15. I can't believe you're going to all this trouble, but I really do appreciate it. I put my GG Grandmother Marilla Blair Norton on Find A Grave in the Loraine Cemetery ... I thought it was the same as Eight Mile Grove. It looks like I’ll have to delete that memorial and put her on the Kemmis Cemetery, maybe. It kind of makes sense now that I think about it, her brother Hiram Blair is buried there and her sister Nancy Blair married William H. Kemmis. Thanks again for educating me... I'll be checking back. I very recently got my hands on a photo the "Eight Mile Corners, Rickel, Ill" and "County Line School, Rickel, Ill" , both indicating that the currently named Kemmis Cemetery is the correct plance for your GG Grandmother since I'm thinking 'Eight Mile' is the intersection of Ill 92 & Ridge Rd, where you turn to reach the cemetery. 2/12/12 I was corrected last fall on the school location - County Line School was at the intersection of Ridge Rd and Osage. Eight Mile Corners is not likely to be the intersection of 92 and Ridge, since I also learned last fall that Eight Mile GROVE is where Bob Smith is building his new home (From Prophetstown, take WAshington, make a right at the "T", left around the 90 degree turn and that was Eight Mile Grove). 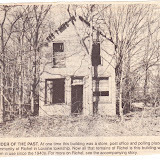 I'm hoping to take the friend that lived at Eight Mile Grove for a ride next fall, along with the photo and maybe I can learn more information. 9:31 AM If this gets posted twice, I apologize - my connection seems to be giving me grief. This past fall, my information was corrected regarding County Line School and Eight Mile Grove. I still can't confirm where Eight Mile Corners was located, but continue to ask as I meet new people that grew up here. County Line School was at the "T" located at the end of Ridge Rd where it intersects with Osage Rd. Eight Mile Grove is where Bob Smith is building his new home - from Prophetstown, take Washington Rd, continue to 'T', turn right, follow 90 degree turn in road and that's Eight Mile Grove. I only see the gentleman that grew up there in the fall and I'm hoping he has photos of his childhood home. I failed to ask if there's a cemetery in that area other than Kemmis, but I'll do my best to remember next time I see him.